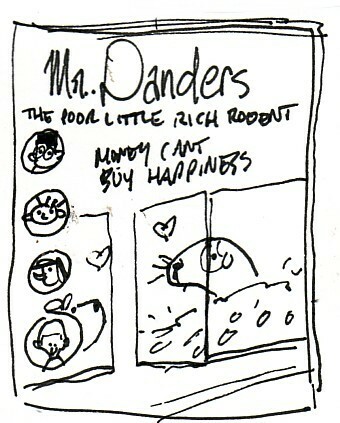 Above: my sketch of Mr. Danders from the comic strip CUL DE SAC. 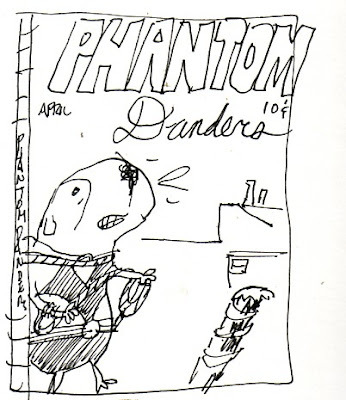 Everyone knows Danders: he goes on wild adventures sometimes and he really just wants to stay home (which is a cage and an exercise wheel at Blisshaven Primary). The premise: "What if Me. 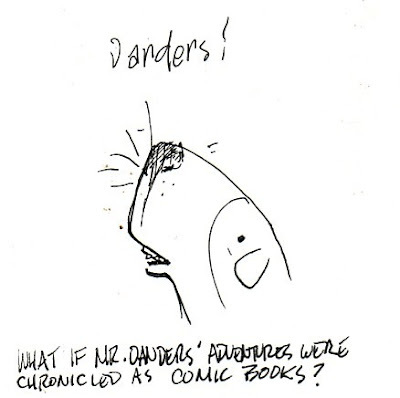 Danders' adventures chronicled as comic books?" 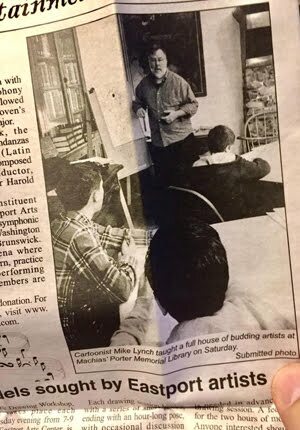 I don't know how Richard Thompson got himself born the same week that the NYC Comic Con starts, but the lucky fellow did. So ... happy belated birthday to my friend! 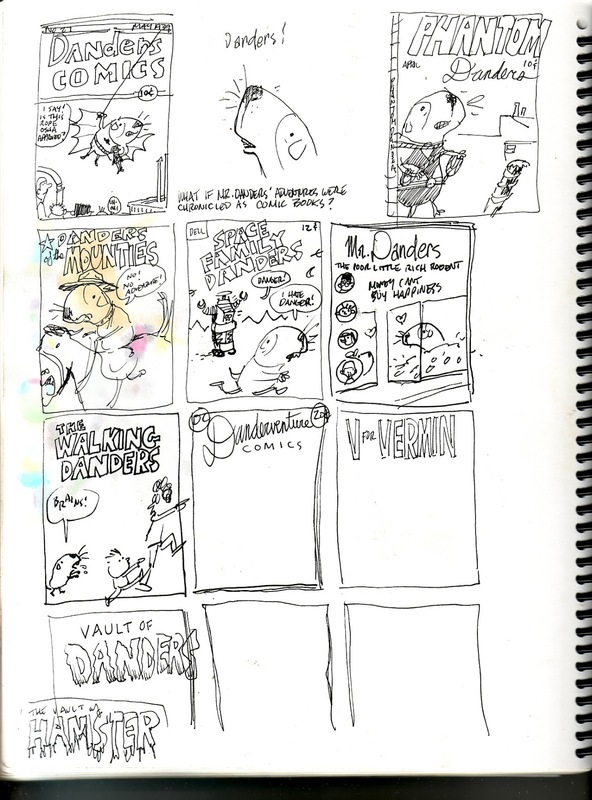 Now, speaking of his CUL DE SAC comic strip and one of the biggest comic book conventions ... here are some doodles from the back pages of an old sketchbook wherein I imagined the reluctant hamster Mr. Danders on the cover of some comics. 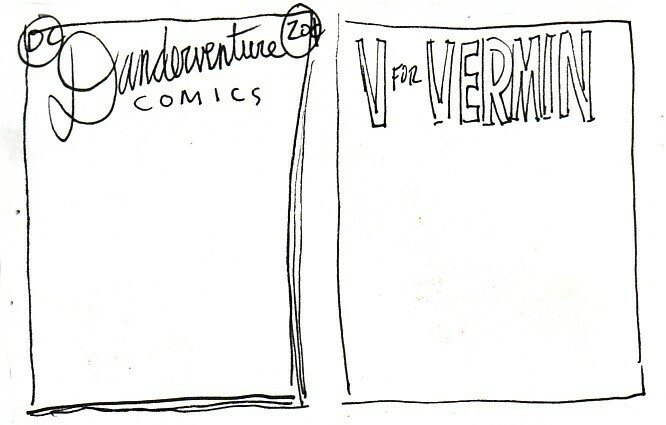 I pretty much forgot about 'em! I would sketch some comic book logos and see what happened. 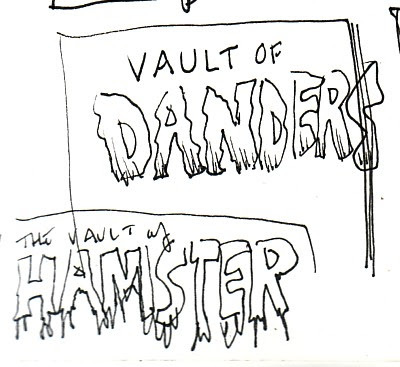 Here are a few: VAULT OF DANDERS and VAULT OF HAMSTER. 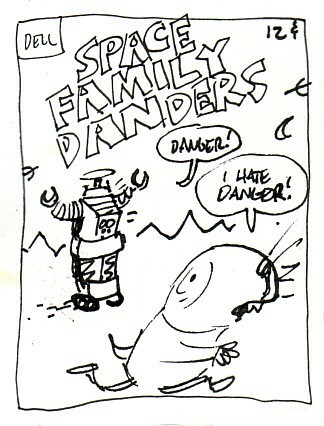 Here's a parody cover of Dell/Gold Key's comic book SPACE FAMILY ROBINSON, except it's now SPACE FAMILY DANDERS. 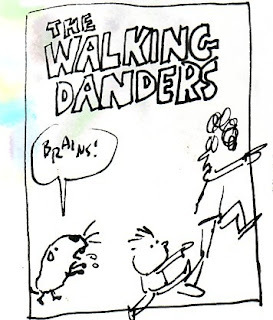 The Robot says as he is wont to say, "Danger!" And Danders responds by trying to run out of frame and replying, "I hate danger." 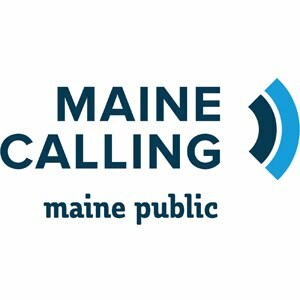 Okay, you get the idea. 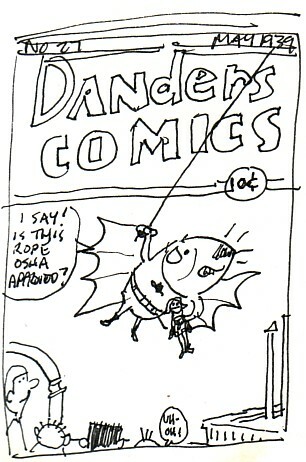 Here is Danders on the cover of DETECTIVE COMICS #27, the famous Batman debut comic. 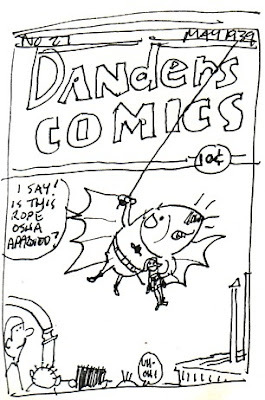 Word balloon (for those who cannot read my scribbles): "I say! Is this rope OSHA approved?" 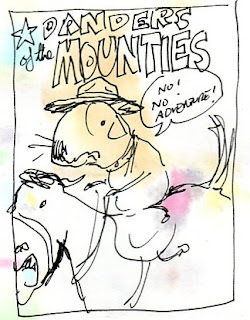 Here's DANDERS OF THE MOUNTIES (a spoof of the TV series and Dell comic SERGEANT PRESTON OF THE YUKON; click here to see my blog entry about the wonderful Giolitti art) where he is on horseback, clothed in full Mountie regalia, imploring the reader, "No! No adventure!" The bit of color is from a watercolor sketch of a vomiting cat bleeding through from the opposite side (see Last Night's BLAARGH!, March 10, 2011). 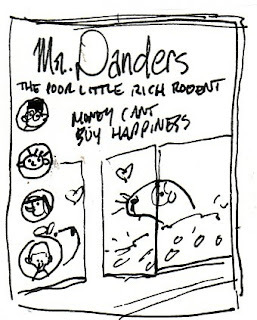 And a RICHIE RICH take with Danders as "The Poor Little Rich Rodent" in "Money Can't Buy Happiness," and that's supposed to be Danders in a pool of coins ala Scrooge McDuck. 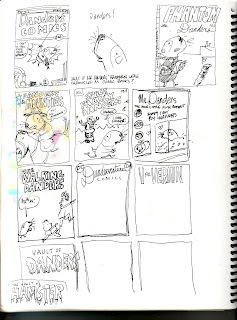 The sketchbook is now full of drawings (every page front and back) and will be shelved now. 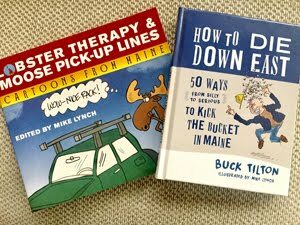 Thanks for letting me share these. They were fun to draw and deserved a little sunlight. Hope you enjoyed them. Dell never published Lost In Space Or Space Family Robinson. Gold Key's Space Family Robinson never had the TV robot B9. 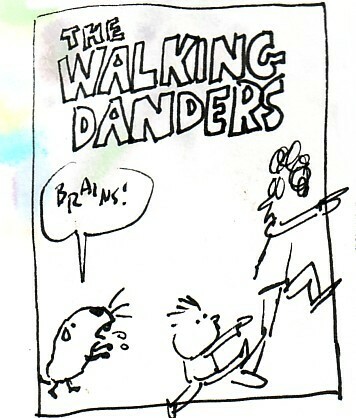 It was about a totally different Robinson family who happened to be lost in space. The TV robot DOES appear in the early 90's Innovation comics's Lost In Space. Smeg: I know you nitpick because you care. No worries.